I've just read a terrific paper by Holly Dolliver on using Google Earth to teach geomorphology (abstract, most of the body). She mainly uses the historical imagery feature of GE to show the change in landscape with time and the elevation profile tool to show the topography. She spent a lot of time searching out some great examples to illustrate her paper but didn't provide a KML file of the places so I've captured most of her examples in this file. The placemarks in 'Show Elevation Profile' folder need you to right click the placemark in the places column then select 'show elevation profile' to turn it on. 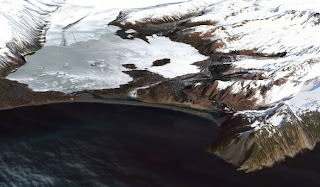 1] turn on historical imagery on the top bar in Google Earth by clicking the clock with arrow icon. With Katama Bay, this illustrates long shore drift and I've left you to play with the historical imagery time slider ( above) as you wish. Very interesting. Thank you for creating this, and thank you for including the link to Holly's paper.